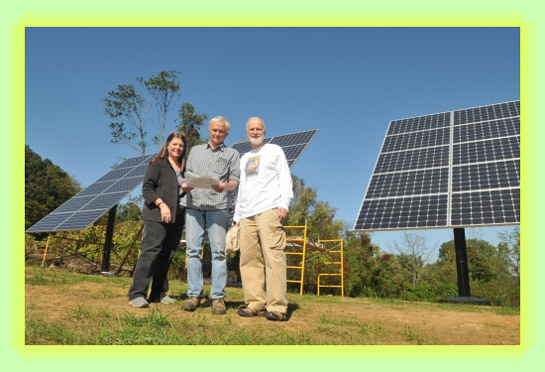 Winnie Scherrer, left, and John Hoskyns-Abrahall, right, owners of Bullfrog Films, flank Bill Hennessy, co-owner of Berks Solar, in front of solar panels installed on Bullfrog's Exeter Township property by Hennessy's firm. Solar energy gaining favor as power option. A film publishing company that releases environmental and socially conscious movies, owners John Hoskyns-Abrahall and Winnie Scherrer needed a way to keep their business going when the lights went out. They turned to the sun and Berks Solar for the solution.